The submerged electric arc furnace (SAF) has proven a versatile unit in numerous metallurgical applications for more than a century. Countless innovations have made this furnace type become the most commonly used furnace for increased metal recoveries and slag-cleaning operations. In many applications, SAFs are also employed as primary melting units (e.g., Ni Laterites, Si production, FeMn, FeCr, etc.). Furnace power supply as well as capacities has been continuously increased over the years so that modern SAFs can reach more than 100 MVA as well as more than 100 tph in throughput. 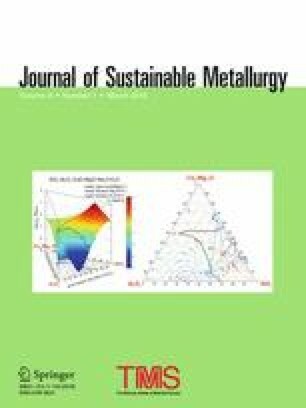 The present paper aims to provide a thorough overview of the principles and buildup of modern SAFs and to present various examples from recent industrial installations as well as current topics in pyrometallurgical research. Examples of the buildup and special equipment (such as cooled wall panels, Soderberg electrodes, etc.) of modern SAFs are demonstrated. The paper also presents metallurgical, thermochemical, and physical fundamentals of slag cleaning as well as particle settling. Furthermore, industrial examples from two African sites are discussed, which highlight the advantages of the SAF for metal recoveries. Special emphasis is given to an innovative slag-cleaning concept through magnetic agitation. Research topics presented range from the inertization of red mud, to Co recovery through the retreatment of dumped slag and the valorization of Pb- and Zn-containing slags. The contributing editor for this article was Annelies Malfliet.